When it comes to omega 3 supplements for hunting dogs, it can seem like there are hundreds of options. Some are good, some are bad, and others fall somewhere in the middle. Supplements are definitely a tricky game. Since they aren’t regulated by the FDA, you really need to do your homework & make sure you’re buying from a regulated source. If you buy from the wrong source or brand, you could end up buying some really shady product. For exactly that reason, we’ve vetted a few products for you to give you a good idea of where to look when you’re trying to look for omega 3 supplements for hunting dogs. If you’re looking for nutritional products for your hunting dog, you should start with the company that focusses entirely on them. Alpha Dog Nutrition dials their products in 100% on hunting dogs, and they tell everyone else to go somewhere else. The fact that they’re so passionate about their bird dogs speaks volumes, and they make omega 3 supplements for hunting dogs specifically. Vitality is a krill-based omega 3 supplement, which carries a lot of advantages over traditional fish oils that you’ll find from a lot of other brands. Krill oil contains all the good stuff that fish oil does, along with phospholipids and the important carotenoid, astaxanthin that isn’t found in traditional fish oil. Without getting too technical, astaxanthin essentially makes the omega 3’s in Vitality easier for your dog to digest & absorb – which is the whole point of the supplements in the first place. 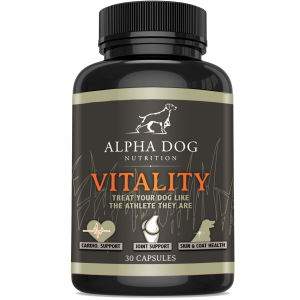 Offered in capsule form, Vitality is relatively easy to give to your dog as well. There’s no mess that you run into with liquid fish oils, and the capsules don’t contain all the nasty fillers & additives that are required to make the chews that seem to be popular among brands today. Basically this means that they contain all the good stuff, and no extra junk that isn’t good for your dog. Simply stick the capsule into a chunk of hot dog or a pill pocket & you’re good to go. Vitality grabbed our #1 spot because it’s made by a company that truly understands and respects our lifestyle, and their products reflect that. 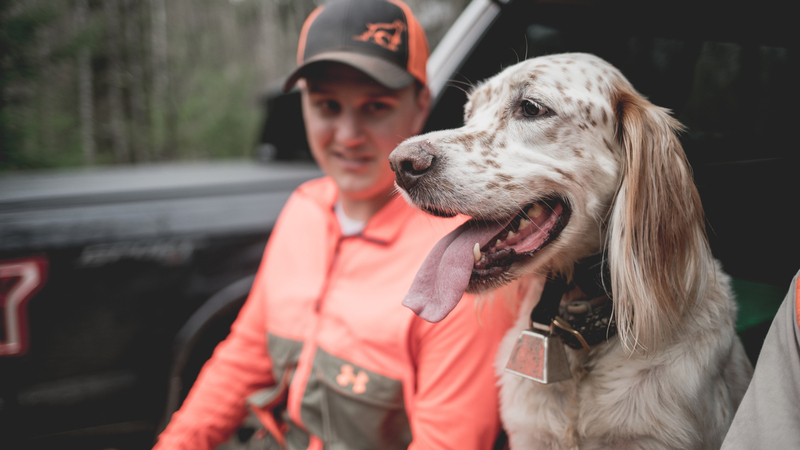 As hunters themselves they’re simply setting out to keep their dog’s healthy as long as possible, and in doing so have created some incredible products for the rest of us to give our dogs. 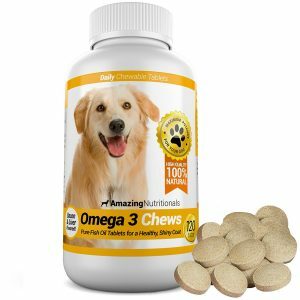 Amazing Nutritional’s chewable omega 3 tablets are the top-ranked omega 3 supplement on Amazon.com. While that’s certainly something to be proud of & says a lot about their popularity, there were some minor things about it that kept them from sliding into the #1 slot on our list. The biggest thing is that they come in tablets. As we mentioned before that forces them to add quite a few extra ingredients. If you look at their “inactive ingredients” list, you’ll notice a few things that we’d just rather not have in our dog. Microcystalline cellulose, desiccated pork, whey, & stearic acid are in there to name a few. While this certainly provides a convenience factor, we’d really rather not see that kind of stuff in our dog’s food. As my dad used to say: “Keep it simple, stupid!”. It’s certainly not all bad though, and we’re not trying to take anything away from Amazing Nutritionals. They clearly have a product that people on Amazon seem to appreciate, and that’s a pretty big sample size. The reality is that they’re trying to serve every single dog out there, and in doing so fall a bit short if you’re looking for something specific to your hunting dog. Grizzly makes probably one of the most popular fish oils out there on the market. With a cheaper price point it’s relatively easy to see why. Delivered in liquid form, it is definitely a bit messier than capsule or tablet delivery systems. That being said, it gets the job done! If you look at Amazon, Grizzly is probably one of the most imitated nutritional dog products out there. There are countless companies trying to ride the wave of popularity Grizzly has sustained, but that just kind of comes with the territory. That being said, there are a few things that we’d like to point out if you plan on giving this to your hunting dog. The first is that if you look at their label, only 29% of the liquid actually contains omega 3’s. To us, that’s somewhat alarming. The other thing is that this is derived from salmon, which already take a huge beating due to commercial farming & fishing. As someone that’s mindful of conservation, that doesn’t sit super well with us. We’d rather see the uses of salmon reserved for eating, and not overdo it with biproducts that could very easily be sourced from something more plentiful – like krill. Grizzly obviously makes a great product, but they got our #3 spot due to the fact that they use salmon in their omega 3. While this is a solid option, they don’t make their omega 3 supplements for hunting dogs specifically. Vetriscience Laboratories is a pretty good company, but the main reason they fall relatively low on the list is because they are gearing their product towards everything from lazy house cats to active hunting dogs. While we certainly understand why this would make sense for them financially (bigger market to sell to), it doesn’t really make sense for our dogs. If you’re looking to buy omega 3 supplements for hunting dogs, that likely means that you’ve put in the time, effort, & money to make sure you have a good dog in good shape. With that being the case, our suggestion is to buy your supplements from someone that truly studies & understands hunting dogs. You’re going to have a better experience doing that, and you’ll also be supporting fellow sportsmen & women! 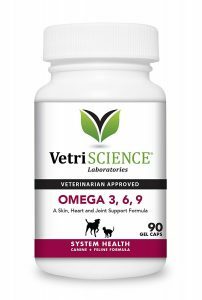 Much like a few others on the list, Vetriscience Laboratories does make pretty good products for most pets. We aren’t taking anything away from their company or mission, they simply aren’t serving our specific market as well as other options out there. We promise we’re not just putting this one here to prove our point about Grizzly knockoffs. Well, maybe we are – but it just goes to show what happens in this market. Zesty Paws offers essentially the same offering as Grizzly, but at a higher price & lower quality. While Grizzly already has an alarmingly low 29% of it’s liquid containing omega 3’s, Zesty Paws is all the way below 25%. So when you’re looking for omega 3 supplements for hunting dogs, please be sure to do your research first. Not only will you be spending more money than you need to, but you’ll also end up giving your bird dog a lower quality product. This isn’t to say that Zesty Paws’ products are bad for your dog, but there are far better options out there. This made it on the bottom of our list due to the fact that they are clearly just trying to copy Grizzly with a lower quality product and over twice the price.